Lacrosse and football cleats serve the same basic purpose: to give the players extra traction on different types of surfaces, from natural grass to artificial turf. This helps with player mobility while helping protect them from injury. Although similar in many ways, a few differences exist between the cleats for lacrosse and football. Football and lacrosse cleats must deal with wet, treacherous ground as well as dry turf, so each need a variety of stud options. Cleats for both sports offer molded studs, where they're built into the soles, as well as detachable studs, which allow the players to change them out. Both sports use cleats with leather or synthetic uppers. They also focus the location of most of the cleats along the outer edges of the shoe for maximum traction during lateral movements. Shoes for the two sports differ in how well they enable air to flow around the feet. Lacrosse shoes are designed for breathability while football cleats must provide protection from the cleats of other players in close-quarters contact. Many lacrosse cleats have mesh vents in the uppers for extra airflow. Leather uppers provide more breathability than synthetic uppers, even without vents, which don't appear on many football cleats. Although the number of studs may differ by cleat style and the player's preference, in general, lacrosse cleats have more studs than football cleats. A basic cleat layout for a lacrosse shoe is four studs around the heel and six to eight studs in the toe and ball of the foot areas. Football cleats typically have two studs at the back of the heel and five under the toe and ball of the foot. Both sports offer cleats in different heights, but the differences are more dramatic in football cleats. 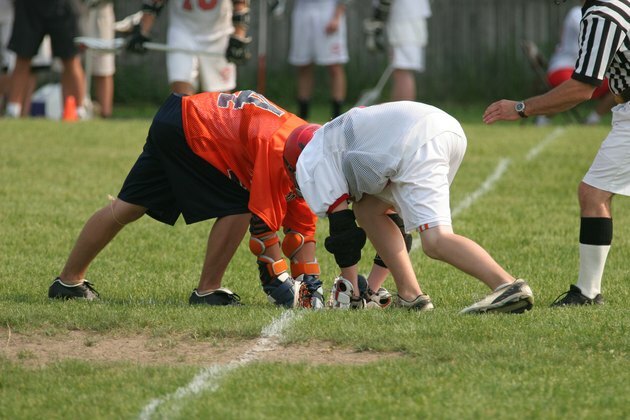 Lacrosse uses mid-cuts for support and low-cuts for flexibility. Football cleat styles tend to vary by position. Linemen need great ankle support, so they often choose high-tops. Mid-cuts support the ankles, but they're flexible too, which makes them ideal for quarterbacks. Players who seek maximum speed and agility might go for low-cut cleats, which tend to be lighter.